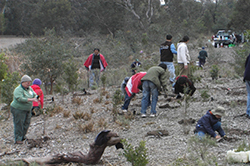 The La Trobe Wildlife Sanctuary offers a variety of volunteer opportunities for currently enrolled La Trobe University students. Our Volunteer Program is designed to foster career ready skills in students and demonstrate the breadth of career opportunities in environmental science, research and education. Volunteers can assist at the Sanctuary from Monday to Friday. We prefer student volunteers who are able to commit to a regular day and time with an ongoing project. Please note, as the La Trobe Wildlife Sanctuary is not a zoo or wildlife park, we cannot offer any direct animal handling. As part of the University's Child Safety Commitment all staff and volunteers on campus must have a valid Working With Children Check (WWCC). This includes student volunteers. Apply for a Working With Children Check. You must have one before applying to be a volunteer with us. Complete the online Volunteer Application form and upload your WWCC. Once we have processed your application, you will be sent an email from Rapid Global and prompted to complete a short online OHS induction. This must be completed prior to your first shift. You will them be sent a fortnightly newsletter with available opportunities and details on how to sign up for specific shifts. The La Trobe Wildlife Sanctuary also offers placements, or internships, for current La Trobe University students enrolled in a relevant Work Integrated Learning (WIL) subject. Applications are strongly encouraged from students currently enrolled in the subject AGR2WIL within the Bachelor of Agricultural Sciences or Animal and Veterinary Biosciences. To apply for a WIL placement please email your cover letter, CV and a copy of your latest Academic Transcript to wildlife@latrobe.edu.au, clearly stating that you would like to apply for a WIL placement. Please speak to your relevant course coordinator for more information.